Backpack Becky: "We're Not Staying in Belgrade More Than a Day"
"We're Not Staying in Belgrade More Than a Day"
Belgrade isn't the prettiest city you'll ever see. Not a great way to start a review but you can’t hide from the fact, that even though the above image has potential, this city is looks drab and dreary. This is a grey city with not much of a sense of optimism, however the city is on the rise and the prices are cheap so maybe Belgrade is worth a few days of your time, just don’t visit with high hopes and romanticised expectations, but make the most of what it has to offer. I’d recommend staying in a sociable hostel as the staff here will be the ones to show you the hidden bars, and you won't have to wonder around aimlessly looking for a party. My friend and I stayed at the Green Hostel, which was about a 5-10 minute walk from the station but not too easy to spot as the tiny sign was hidden amongst others on one of the seemingly infinite grey buildings. Up six flights of dark stairs later, you'll find a small hostel but with a sociable, cosy atmosphere, giving plenty of opportunity to socialise with the other backpackers. There was a good mix of people at the hostel, great staff and a free beer on arrival! Not a lot to be honest. I’m sure if you really dive into the hidden parts of the city you could find some hidden gems but I found that the typical tourist sights weren't present. 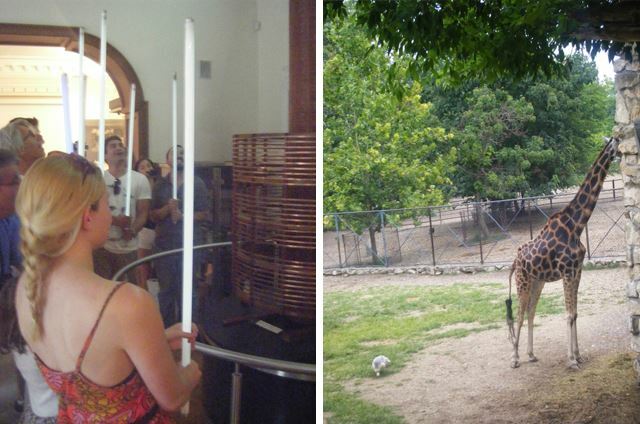 Places that were on my agenda included the zoo, a few churches and the Nikola Tesla museum, which was definitely worth a visit, if only to hold a wireless fluorescent bulb and act like a Jedi for five minutes. I didn't try any Serbian dishes, but overall the food was good and cheap. You can find a few glamorous streets of bars, restaurants and open cafes where the cocktails are cheap and the atmosphere is flowing. This is a main plus of Belgrade. However, the only downside is that cigarette smoke will follow you everywhere. Fair enough if you like to smoke, but if not, then prepare to have your meal with a side of ash. On the drink front you certainly won’t fall short, so maybe just visit Belgrade for some bevvies, good music and good parties then spend your day eating and being hungover. Along the Danube, in the centre of the city you’ll find a fair few boat parties which do look like something out of a Made in Chelsea holiday. They look pretty awesome, and the prices aren't going to kill you. Great music, good atmosphere and perhaps the main reason why Belgrade is becoming more popular. Even though I haven’t got the greatest opinion about Belgrade, I’d say it’s a destination worth your time and a place that is becoming more and more popular with backpackers. Go to Belgrade with an open mind and a view to drink and party and you’ll be fine, just don’t expect a city of high culture and beauty, unless you get really drunk then it may seem quite pretty after all.